Russia is stepping up its space programme, half a century after Yuri Gagarin launched a Cold War space race by becoming the first human in orbit. Fifty years ago on April 12, with a rousing cry of “ Poekhali!” ( “Let’s Go!”), cosmonaut Yuri Gagarin raced skywards to become the first human in space. Launching in Vostok 1 from Kazakhstan at 9.06am that sunny day in 1961, the 27-year-old carpenter’s son circled the Earth once on a 108-minute space flight, before parachuting safely to ground in the Saratov region of the USSR. Driven by the Soviet Union’s quest to assert technical superiority over the United States, Gagarin’s flight became one of the 20th century’s most significant achievements. This short but epic foray into the heavens inspired millions of people around the globe, and fired up a Cold War space race between the superpowers that was not explicitly geared towards mutual destruction. “This was the finest competition the human race ever staged: who could build the best spacecraft, the best manned rocket,” said Alexei Leonov, another member of the original 20-man squad of Soviet cosmonauts. For three decades the sides pitched their finest engineering minds against each other. The US Moon landing in July 1969 may have eclipsed all other achievements, but it was still the Soviets who generally led the race. Space exploration became increasingly co-operative after the end of the Cold War, especially with the assembly of the 18-country International Space Station (ISS). More than 500 men and women from 38 countries have now been in orbit. 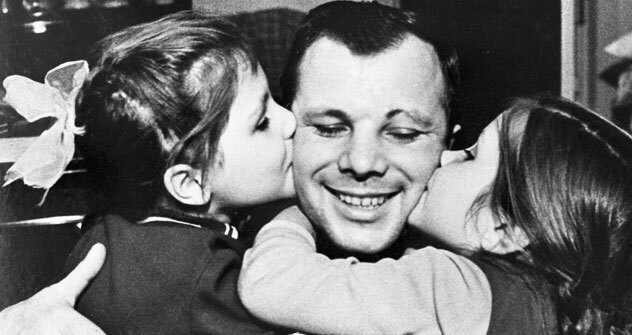 But on April 12, Russians everywhere will honour the spacefaring legacy as embodied by Gagarin. The pilot died in an air crash in 1968 while in training for a second space mission, and his ashes are buried in Red Square. Now, as in the past, the resolve to drive his legacy further comes from the top. “Space will always remain a priority of ours. This is not just somebody’s interpretation, it’s our official state position,” President Dmitry Medvedev told members of the ISS crew in a radio link-up on April 12 last year, Cosmonautics Day. Russia’s $3bn (£1.8bn) annual space budget cannot compete with Nasa’s almost $19bn (£11.6bn). But more funding has been allocated to space in recent years as oil and gas revenues surged. Russia is a leader in the commercial satellite launch market. And while the Americans had their manned Moon and Mars mission hopes trimmed by the Obama administration, Russia keeps those hopes alive, aiming to establish a Moon base by 2030 and stage a Mars mission shortly after, according to Anatoly Perminov, chief of the Roskosmos space agency. It’s all a far cry from the heady days of the Vostok 1 mission, when no one knew if the young Gagarin would even make it home alive. Either in jubilation or to cover his nervousness while orbiting the planet at 17,000 miles an hour, he whistled a Soviet patriotic song over the radio, the opening lines of which are “The Motherland hears, the Motherland knows/Where her son flies in the sky.” In a few hours, word of his feat sped round the globe and a new era had begun. However, the competitive vigour of both programmes tailed off in the Seventies after a series of US Moon landings. The space race in effect ended in July 1975 when US and Soviet crews docked capsules in orbit, symbolising a partial easing of tensions between the superpowers. After the Soviet collapse in 1991, Moscow and Washington pooled resources in missions to Russia’s Mir space station, which after 15 years in orbit was scuttled over the Pacific Ocean in 2001. Meanwhile, assembly of the ISS began in 1998 and the complex now comprises 14 pressurised modules. After 30 years of service and 135 launches, Nasa’s shuttle fleet made its final run to the ISS last month. When the shuttles are fully retired later this year, the station will be dependent on smaller Russian craft to ferry crews and supplies until a new US space taxi is produced. Shifting the transport burden boosts the role, prestige and income of the Russian space agency, which suffered so acutely from underfunding in the Nineties that it had to film commercials on Mir and send tourists to the ISS to raise money. Half a century after he beheld the spectacle of our precious and fragile world from above, Yuri Gagarin would surely have applauded such a lofty goal.